August 9 2013 was the final day of the 10 week long 2013 hackNY Summer Fellows program, which places a number of students from colleges as far away as California and Puerto Rico with NYC startups, and also houses them in NYU dorms. On the evening before, the fellows had the opportunity to demo either their intern work, or another project of their choice. In a 90 minute session 29 demos covered everything from sophisticated data visualizations to competitive twerking to music sharing using webRTC to displaying facebook as a unix file system to rooting out spam blogs on tumblr. An appreciative audience included a large contingent from Girls Who Code. Video is below. Go to the YouTube description to skip to individual demos. On January 23 2013 Goodnik hosted a meetup – New Year, New Social Enterprise Tech – at New Work City NYC. Presented platforms were Charitable Checkout – a system of rewarded giving for celebrity-sponsored causes; ThreeRing – a simple method for teachers to document their students progress; Standbuy.us – a crowd funding platform specifically created to ease the financial stresses of cancer; Fiestah – a contact resource for event planners; and iGiveMore – a web platform for charitable fundraising. Video is below. Go to the YouTube link to skip to individual segments. On August 1 2013 the 21st Century Democracy & Technology Meetup hosted a NYC Civic Tech Demo Night at Tipping Point Partners NYC. Introducing the night was Tipping Points founder and CEO Art Chang, who revealed a forthcoming expanded collaboration – a “tech campus” – between his firm, New York Law School, and other institutions. Presenting first was FundElevator, a new crowdfunding platform for both causes and politicians that will have its soft launch in the next few days. The second was NYC Votes. Art Chang is also the Chair of NYC Voter Assistance Advisory Committee(VAAC), part of the NYC Campaign Finance Board‘s (CFB) Voter Assistance Unit, as reconstituted by the 2010 Charter Commission. The CFB has three primary mandates: administering the Campaign Finance Program, publishing the Voter Guide, and overseeing the Debate Program. The CFB provides easily accessible and comprehensive information on candidates’ campaign finance and works to make candidates and elected officials more responsive to New York City citizens, rather than special interests, by reducing the opportunity for campaign contributors to influence candidates and elected officials and by providing a means for credible candidates who might not have access to “big money” to run competitive campaigns via a matching funds program. To assist in this purpose the VAAC spawned the 21st Century Democracy project which in turn spawned a Digital Action Working Group of leading local techies,namely AppOrchard, Method, and Pivotal Labs, who set to work on creating an app – NYC Votes – to help achieve the CFP’s purpose. NYC Votes is aimed to provide the complete voting experience from registering to vote, to learning about the candidates, to funding candidates (thereby gaining them 6x NYC matching funds), to casting a vote at the poll site on Election Day. The app is scheduled to go live on Aug 7 2013 at the New York Tech Meetup. This night was something of a dress rehearsal for that. 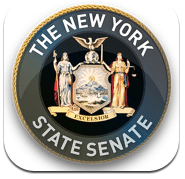 The New York State Senate today announced availability of “NYSenate for iPad,” the first application in the nation developed by a legislative body for the Apple iPad. The application can be downloaded for free today from the Apple iTunes App Store. Like its predecessor, NYSenate Mobile for iPhones and Android phones, the app enables users to search for bill information, contact their Senator, review event calendars, read Senator’s blogs, watch archived video of Senate Session, Committee Meetings and Public Hearings, and even submit Freedom of Information Law (FOIL) requests. “NYSenate for iPad” was built entirely in-house by Senate staff, at no additional cost to taxpayers. As with all software developed within the Senate, this mobile app has also been released at (see http://github.com/nysenatecio) under dual BSD and GPLv3 open-source software licenses; other legislatures, as well as non-profit organizations, media and small businesses are free to leverage the software to develop their own custom applications for the iPad. The Computer Science and Artificial Intelligence Laboratory at MIT has released list.it – “a simple, free, open-source note-keeping tool to help you manage the tons of little information bits you need to keep track of each day.” It’s available for Firefox version 3.0 or greater and for iPhone and Android. After 15 months of development, version 1.0 of OpenShot Video Editor has been officially released! OpenShot is a free, non-linear video editor for Linux. More info.